RHE are delighted to welcome Jenny Morris as a food safety blogger for RIAMS Communities. Until January 2017, Jenny worked for the Chartered Institute of Environmental Health (CIEH) in London. In May 2014, she moved from her long-standing food policy role at CIEH to become Head of The Institute of Food Safety, Integrity & Protection (TiFSiP). TiFSiP was set up as a new CIEH initiative that aimed to address the increasing challenges faced by all those working to ensure that food is safe, healthy and trustworthy, through cross sectoral collaboration. Jenny recently retired from the Advisory Committee on the Microbiological Safety of Food, the independent expert committee that provides the Food Standards Agency with risk assessment advice. She has also been a Member of the London Food Board, which provides advice to the London Mayor on food strategy. She is a Chartered Fellow of the CIEH and a Fellow of the Royal Society for Public Health. She was awarded an MBE for Services to Environmental Health in 2014. Jenny is involved with the FSA as part of the “Regulating our Future” agenda and RHE look forward to Jenny bringing some interesting and insightful blogs to the Communities site. If you have a gov.uk email address, you can join RIAMS Communities straight away by clicking here to create an account. 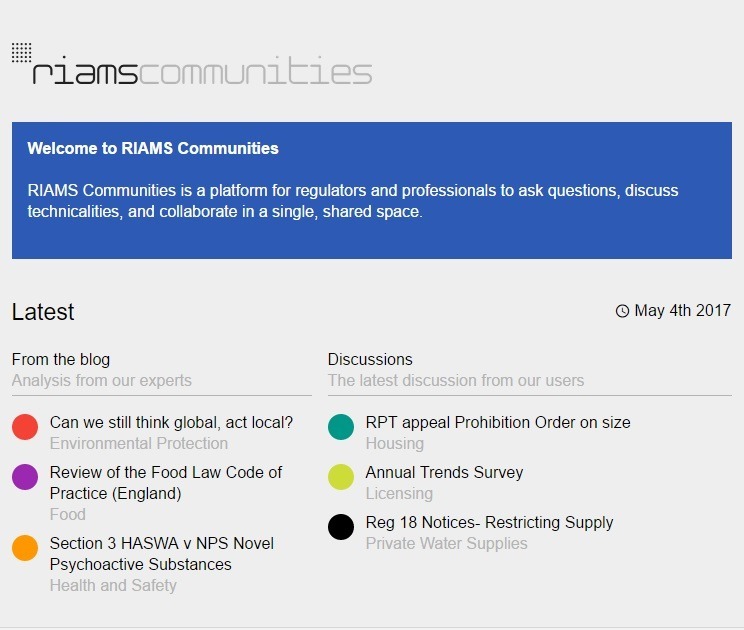 If you already have a RIAMS Communities account, click here to read the latest discussions and blogs.